Hi Young Doctor – Help! 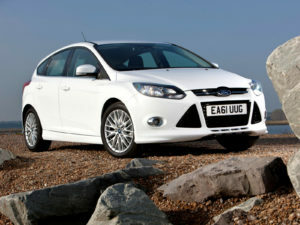 Reference our Ford Focus, 2012 Titanium hatchback, with the 6-speed Powershift transmission, 161bhp, Duratorq 2.0 TDCi. I think that my main dealer has failed to service some essential parts, so I would like to do a service myself. I have found that the 2.0-litre HDi diesel engine in the Peugeot 3008 appears to be the same (indeed, is fundamentally. Doc), but amongst the various differences, the oil filter is in a different position. After a search, I found it in my engine bay, and I believe there is a special spanner for this oil filter. Could you please tell me what size it is, and where I can purchase one online? There is apparently no Haynes manual for this engine or gearbox. Do you know of any publisher who has released a manual for it? Happy New Year to you all. I have been a reader since day one, and have read every issue, save one which was lost in the post. Hello Bert, if I may be so familiar! What you need is the 27mm “Crow Foot” spanner that is an official Ford special tool. You could get it from a Ford dealer (they might need to order it though!) or you can find them a bit cheaper elsewhere on eBay and Amazon. From Laser Tools it is part number 5365. It could cost you £25 odd, I am afraid, but it is what you indeed need, as an ordinary 27mm socket and drive bar is just too big to get in there. Have fun getting dirty! I am sorry, but I could not find any workshop manual that covers the 2012 Focus with your engine, only for the 1.6 TDCi. I would advise you not to be tempted by mail order CD manuals, or downloaded files from the internet, as I have been bitten twice by these. They tend to come (when on CD and as pdf downloads) in rather strange file formats that need lengthy conversions with special software to (supposedly) make them screen visible and usable; my PC gave up on the task on both occasions, after working away at it for well over an hour. Maybe there are some that do work, but I would be cautious. I think you will find that there are plenty of YouTube videos available online for most of the routine servicing jobs, but I could not, unfortunately, find one for oil filter replacement on this particular engine. But I don’t think, with the special tool, and knowing where the filter is now, it will be too difficult, although you might just skin a knuckle or two. So many loyal Diesel Car readers like you that go back to the first issue that it brings a tear to my eye!